It is not intended as an economic history. The 'money men', goldsmith bankers and bankers who contributed to the development of Martins Bank in London include Sir Thomas Gresham, 'Court banker' to Queen Elizabeth; Edward Backwell, who rebuilt the Grasshopper after the Great Fire of London and was special agent for Charles II; Charles Duncombe, 'the richest commoner' in England, who welcomed William II and yet refused later to advance money to him; and the Martins, from whom eight generations of bankers have descended. The pioneers of banking in Liverpool, who contributed to the development of Martins Bank as the largest English bank with its headquarters still in the provinces, include merchant adven­turers like the Heywoods; and Sir William Brown, first chairman of the Bank of Liverpool, and founder of Brown, Shipley and Company. The private diaries of bankers and clerks have been quoted in some detail, for these make the reader feel again what life was like in the past. It is interesting to learn that Sir Thomas Gresham and his apprentices were addicted to gambling, that Christmas money was an important source of income for bank clerks for many years, that friction was often caused amongst clerks by the rota for 'sleeping in', and that even in the staid Victorian era the bottle proved to be the downfall of a number of bank clerks. It is only in comparatively recent years that banking has become a safe occupation. 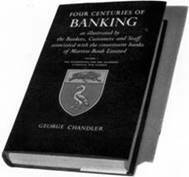 This volume produces much evidence of the great anxiety caused to bankers by successive financial crises. A number of runs on banks are described by contemporary diaries dating from the 17th century to the 20th. The alarms caused to bankers by the outbreaks of war, by rumour and by very frequent fluctuations in the Bank rate, are vividly described. The financial problems of to-day seem by comparison, to be less severe, although the attacks on the pound, with which Sir Thomas Gresham had to contend four hundred years ago, are still with us. The sign of the grasshopper is one of the ancient shop signs of Lombard Street. It is associated with Sir Thomas Gresham (d. 1579), Elizabeth I’s financial agent, who played an important part in the development of English banking. Gresham persuaded the Crown to cease borrowing from continental lenders and look to the London money- lenders instead. Realising the potential contribution of the Lombard Street merchants to the national wealth he established the first Royal Exchange (opened by the Queen in 1571), as a meeting place for their business. REBUILT FOLLOWING THE GREAT FIRE OF 1666. THE GRASSHOPPER WAS PROBABLY ORIGINALLY GILDED. Gresham was a wool merchant who also began a goldsmith business around 1563. He adapted his family crest, a grasshopper in gold, as his shop sign in Lombard Street. The grasshopper was used after Gresham’s death by successive goldsmiths on the same site - 68, Lombard Street. These early partnerships evolved into Martins Bank, which became one of the modern clearing banks and was brought into the Barclays Group in 1969. Like Barclays, Martins developed from a London goldsmith’s business - the first Martin partner was Thomas in 1703. Its customers were commercial rather than personal. Despite a serious ‘run’ on its reserves in 1890 during the Baring crisis Martins survived and became a limited company in 1891. It began to expand as a clearing bank with a few branches, but its main development came after 1918 when it amalgamated with the Bank of Liverpool - founded in 1831 as one of the first English joint-stock banks. Thereafter expansion was rapid. By 1926 there were 378 branches, but only 28 were in London and the south. Head Office (rebuilt 1932), remained at Water Street in Liverpool (Martins was unique in this respect), and 68 Lombard Street (rebuilt 1930), became the principal London office. Foreign exchange was an important part of the Bank's business at this time, especially in the industrial north where goods were imported and exported on a large scale. 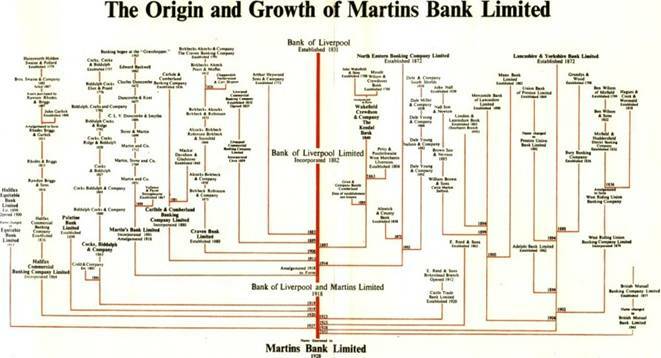 Martins strengthened its position further in the north of England by acquiring the Lancashire & Yorkshire Bank in 1928. Steady expansion across the country followed, despite falling profits during the Depression, so that by 1939 there were 570 branches. World War II brought Martins the honour of storing Britain's gold reserves in the Liverpool strong rooms. During the 50s and 60s Martins gained a reputation as a modern innovative bank, moving into hire purchase in 1958 by acquiring Mercantile Credit, matching the ‘swinging’ mood of the 60s in its advertising, and being only just behind Barclays in its experiments with computerisation and cash machines*. The other interesting acquisition in 1958 was the business of Lewis's department store bank, another Liverpool enterprise started in 1928 and with branches in all the Lewis's shops and at London Selfridges. Like Barclays, Martins had a decentralised structure based on District Boards and Offices. By 1968 Martins was the sixth largest clearing bank, with more than 700 branches. Nonetheless it remained too small to survive independently, and was still largely a northern bank in terms of its high street presence. At first a MERGER with Barclays and Lloyds was proposed but the government opposed this idea of a ‘super bank’ and in 1968 Martins agreed to be taken over by Barclays, being fully absorbed by the end of 1969. The official COAT OF ARMS of Martins Bank combined the golden grasshopper, representing the original Martins partners in Lombard Street, with the liver bird representing the Bank of Liverpool. *This is not quite true, as Martins is the first UK bank use a COMPUTER for regular daily bookkeeping purposes across a network of its branches and Martins is also the first bank to install a CASH MACHINE which uses the principle of card and PIN we know today.